Planning an event? 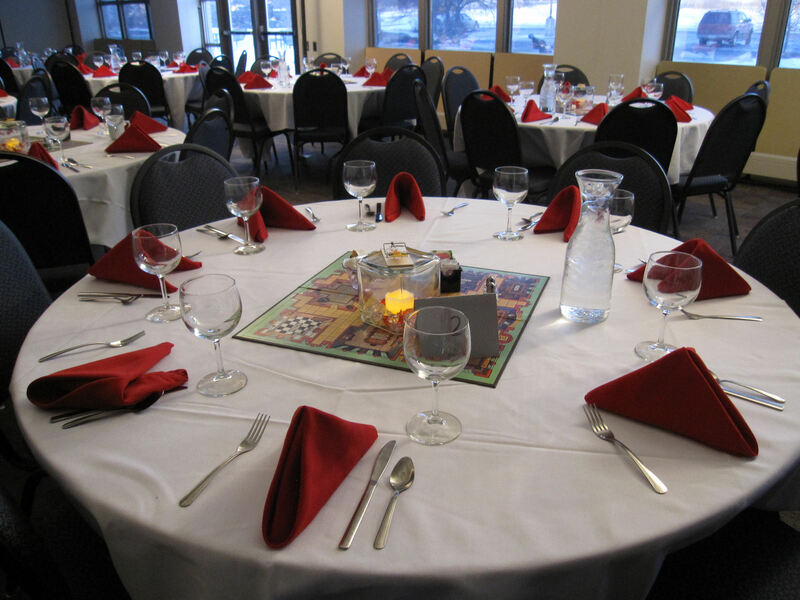 Fridley Event Services is committed to offering high quality rentals and excellent service for events big or small. 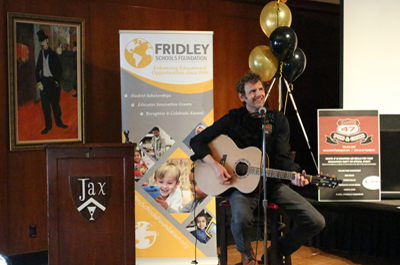 For 20 years, the Fridley Schools Foundation has been enriching educational opportunities for Fridley Public School students and supporting their higher academic aspirations as they build their individual roads to success. 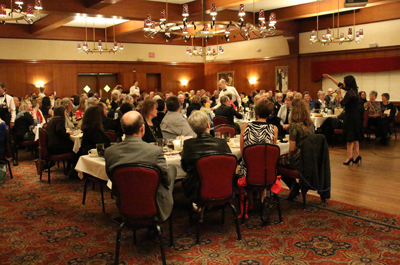 To continue its support and commemorate these successes, the Foundation held its second Black & Gold Gala on March 28, 2019 at Jax Café in Minneapolis. More than 150 community and staff members attended the event, participating in silent and live auctions and donating to support the mission of the foundation. 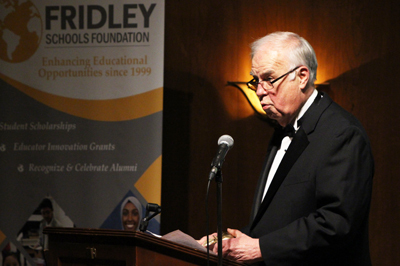 As the largest Fridley Schools Foundation fundraising event of the year, the gala plays an essential role in raising money to support educator innovation grants and student scholarships for graduating seniors. This year, over $27,000 was raised to enhance opportunities for district students. This year, Gordon Backlund, a founding member who was instrumental in the genesis of the nonprofit, was recognized at the gala with the Golden Apple Award. The award is given to a member of the Fridley Public Schools community who has made a significant impact through years of service. Backlund served on the Fridley School Board for 24 years, from 1989 to 2013. It was in 1999, after discussion with the board and then superintendent Mary Ann Nelson, that Backlund took it upon himself to organize and establish the beginnings of the Fridley Schools Foundation. He also served as the foundation’s first president. In addition to being one of the founding members, Backlund has worked to benefit the school district in many ways, including as a board member supporting and championing the district’s journey to all schools becoming International Baccalaureate World Schools. 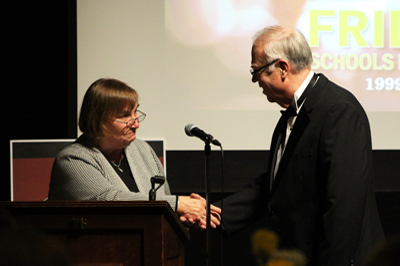 Backlund has also made many contributions to the Fridley community at large. He has served as a state representative for Fridley, as well as serving in several civic organizations including the City Charter Commission and HRA Commission. He was also inducted as a member of the Fridley Hall of Fame, and is a member of a number of community organizations, including the Fridley/Columbia Heights Rotary Club. Backlund thanked all present and past school board members, superintendents, and staff that he had the opportunity to work with during his 24 years on the Fridley School Board. The Fridley Schools Foundation would like to thank event sponsors ATS&R, architecture and engineering firm, as well as the Fridley Lions Club, a local organization that also supports Fridley Public Schools through scholarships, district events, and more. The Fridley Schools Foundation is an independent 501c3 nonprofit that supports the mission of Fridley Public Schools by enriching educational opportunities throughout the school district. Please visit www.fridleyschoolsfoundation.org to learn more. If you see Mr Lance, our friendly custodian, in the hall give him a High-5 and tell him he is doing a great job. Third and Fourth Graders are taking their MCAs this week and next. The reading MCAs will be Tuesday (4/23) and Wednesday (4/24). The math MCAs will be Tuesday (4/30) and Wednesday (5/1). 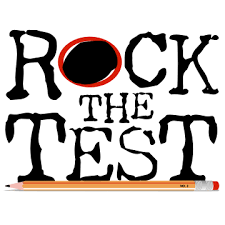 Let's cheer on our students as they tackle those tests!